I didn’t include the Xeric Grant funds in this infographic as income because it technically doesn’t count towards a sale. The funds are specifically meant to aid in the cost of production so you can only get reimbursed once you’ve spent the money. I ordered 500 books (since off-set printing isn’t exact, I got 13 more in my order) for my initial print run because this was the minimum order required to go through Transcontinental, a printer located in Canada that’s been well-recommended. It turned out to be a perfect number for me because one year later, I’m finally down to 50-ish books in my apartment. From that perspective, I do consider Vol. 1 to be a moderate success. My goal was to sell-through the initial print run and that seems to be on track to happen. I’m anticipating a few more people will be interested in Vol. 1 copies once the second Kickstarter comes around so I’m not too worried about getting stuck with the remaining books for too long. Now, for comparison, let’s look at a comparable book put out by a bigger publisher, shall we? The manga adaptation of Soulless Vol. 2 sold 548 copies in Nov. 2012. That’s my entire print run sold through in one month and that’s JUST through North American comic shops. HAHA, there’s definitely room for growth there! Someday, I’d like to place an order for a print run without having a small panic attack…. (*ahem*) but I doubt that’s gonna happen soon. So why would I be willing to give away 63 books, you ask? Well, 14 of those were sent to manga bloggers and publications, some of whom were extremely kind enough to write a few words about Polterguys. I think in general Polterguys was well-received and I’m quite grateful for that. I know a few librarians I met at ALA this year in Chicago appeared more interested in Polterguys thanks to the positive Kirkus Review blurb so it does pay to send out books for reviews. 135 books were pre-sold thanks to Kickstarter or 34% of current sales. That’s pretty major and I’ll always thank my lucky stars crowdfunding comics started getting in vogue in past few years. I seriously could not be more fortunate to have a few comic Kickstarters to model my own campaign from, and have strangers who have never heard of me or my work before be interested thanks to being featured on site. 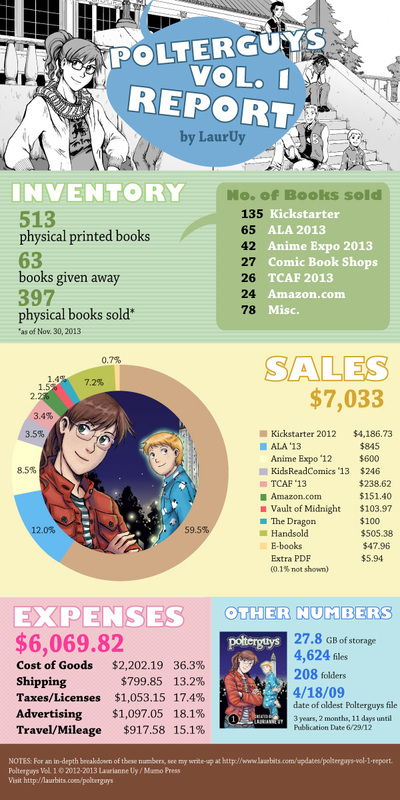 Looking at the numbers, ALA 2013 was my favorite con because librarians and their friends were so amazing and bought a lot of books! Now, if you take ALA, AX, TCAF all together, you’ll see that selling books at conventions face to face with potential readers makes up another 34% of book sales. On one level, I totally understand this and any sane, normal businesswoman would book herself a nationwide convention tour the next time around. So why didn’t I book more this year? We’ll get to that. Short answer: It’s exhausting. Because I don’t do this for a living, I didn’t care too much about the purity of these sales figures per item. That means that Kickstarter figure isn’t just books, it’s also prints, e-books, and shipping fees. At conventions, I occasionally do sketches and sometimes sell prints but they are not a significant source of income at them (yet.) For my own sanity, let’s just call them all general ballpark figures. Always expenses. I was going through my reports on Outright and found these were the major costs throughout the year. Of course, cost of goods sold (aka the Printing Cost) was my biggest one-time expense at $2,202.19. (Sidenote: It is SO important you have good credit, guys. You definitely need to have a sizable amount of credit line to put THAT item on your card and pay it off immediately.) You don’t have to go bankrupt self-publishing but you really need to have financial stability in case things go haywire. Shipping was a pain and this was even before the recent hike in fees across the board. I heard international fees are even crazier now. Not really looking forward to that in future campaigns. The tax line is a bit inflated again. Sorry. I do freelance illustrating on the side and there’s no way for me to split the amount of taxes I pay from sales and that other form of income without me making calculations until next year. BUT I didn’t want to leave that off because it’s too important to neglect. Advertising involves paying for the website where most people encounter Polterguys for the first time, printing posters, bookmarks, giveaways. Ouch. Yeah, I need a new external harddrive. See that time frame? It takes way too long for me to make a book. Self-publishing will not make you an overnight millionaire…but you don’t have to lose money either. I have a little money saved up from this whole deal. I also freelance on the side and try to save up as much as I can from my dayjob. I’m happy that it’s given me a little supplemental income and anytime I get an email that someone’s bought a copy from Amazon or picked up a PDF off of gumroad, it gives me all the fuzzy feelings. There’s a looooot of backbreaking, annoying, non-art-related work involved. It’s overwhelming. So overwhelming in fact that I don’t feel I’ve gotten the hang of balancing everything yet. I want to make more prints for example but in the precious few hours I have during the weekend, I often feel I have to prioritize other things like writing Vol. 2 for example. The list of stuff-to-do is never ending. Because I have to. Because I have no other choice. Because it’s fun and challenging and meaningful and I’m not really that good at anything else.